From repairing the highest utility lines to washing the tallest windows, aerial lifts are incredibly capable machines that tower above us. They help workers take care of our fast-growing communities. 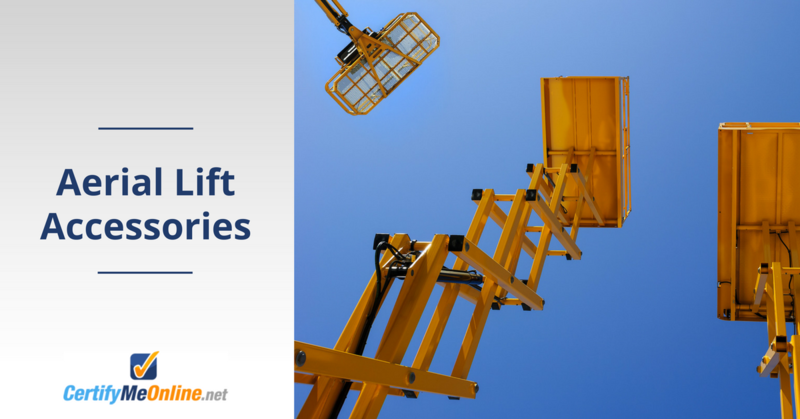 They are used in many industries, like construction, maintenance, utilities, and even aviation, for many different tasks, but even aerial lifts need a little help sometimes. Various equipment makers have created aerial lift accessories to improve the possibilities and safety with aerial lifts. Learn more about some of the most popular modern aerial lift accessories in this post and how they are advancing different aspects of aerial lift operation. The new overhead alarm system from Genie was created to alert operators of overhead objects in the effort to reduce accidents. The alarm system is called the new generation Operator Protective Alarm (OPA) and works with Genie aerial work platforms (AWPs). When the operator makes contact with an overhead obstacle, a “system shut-down” takes place, halting all aerial lift functions. A loud alarm and bright flashing strobe light also turn on to warn others that there is potential danger above. The alarm technology is based on Lavendon’s ‘SkySiren’ system. The OPA can be used with any Genie AWP built since 2002 that was made for certain markets (Europe, Middle East, Africa, and Russia). Plus, the newest Genie OPAs can be transferred from one machine to another, making it easier for operators to use the alarms for aerial lifts that are in operation. The latest of the aerial lift accessories from Genie is the lift guard platform mesh that features two versions, a half and a full mesh screen. This accessory is made for the 6-foot and 8-foot articulated and telescopic boom lifts from Genie that are made with swing gates. The Genie Lift Guard Platform Mesh Full covers all four side of the lift platform, from the floor to the top rail, without covering up the attachment points for the lanyard on the rail. Both the half and full guard platform mesh screens will be available from the Genie factory or as a kit on the lift market, and are designed to fit onto existing platforms with swing gates in less than 30 minutes with two workers. Both versions are made to handle busy, demanding worksites. Hanging repositionable steps are simple yet very handy tools for workers getting in and out of the bucket on a bucket truck. Hanging step bucket truck accessories slip right onto the lip of a bucket to provide operators with a step for improved stability and fall prevention. This one from VersaliftEast can fit onto buckets made with or without liners and is made with multiple layers of fiberglass to ensure strength and durability. Simply place the handing step over the bucket lip on the inside or outside of the bucket, and reposition it when entering or leaving the bucket. A British company, Aerial and Handling Services, just announced a new DRXmulti materials handling attachment, specifically designed for scissor lifts. This accessory looks like a metal bar fitted with four vertical metal bars that attach to the side of a scissor lift. It is designed to hold tools and piping to free up space on the platform and reduce trip hazards for workers. This scissor lift accessories attachment is very versatile. It can be installed on every make and model of scissor lifts (United States, Great Britain and elsewhere), including low-level access platforms like Pop-Ups or Power Towers. Weighing about 30 pounds. The device can be positioned in under five minutes and removed in less than 60 seconds. The accessory should be a great fit for scissor lifts at manufacturing plants and other industrial settings. It will also be a sought-after attachment for scissor lifts at construction sites because it can function as a pipe and rebar rack or a board carrier. All the user has to do is change the jaws for clamps and add board cups. As innovative as these aerial lift accessories, bucket truck accessories and scissor lift accessories may be, they can only do good if operators are properly trained. According to OSHA, only trained and certified operators can be allowed to operate the equipment. Training is the number one way for operators and employers to improve safety on worksites and reduce accidents, superior to any accessory. For top quality, innovative training that operators can complete and be certified in one afternoon, choose CertifyMeOnline.net. Our online courses can be accessed from any device with an internet connection, 24/7, at the operator’s pace. There’s never any specific times or schedules that workers need to commit to, however, the training courses typically take our students only one hour to complete! Once training is completed, operators will be able to print their certification cards and operate aerial lifts. Check out the online and affordable aerial lift training classes from CertifyMeOnline.net today! It takes only a few minutes to purchase your course and create an account. You can also contact us with any questions via our handy online contact form.